Django's "Oui" sounds more like "Wei", a translation would be nice! Q: Django, lorsque vous étiez aux États-Unis, lorsque vous étiez à New York, vous avez certainement entendu Benny Goodman. C'est à ce moment-là que vous avez fait sa connaissance? A: Oui, je l'ai entendu à 400 Club à New York. Q: Et il vous a demandé de jouer, je crois, au concert l'après-demain? Q: Django, when you were in the US, when you were in New York, you certainly heard Benny Goodman. Was it at that time that you met him? A: Yes, I heard him at 400 Club in New York. Q: And he asked you to play, I believe, in concert two days later? Ahh, yeah that explains it. The interview is from June 6 1950, and they're talking about the concert at the Palais de Chaillot two days later on June 8 1950. Django and Benny performed together for the first time at that concert, according to Django they were just going to improvise some tunes, rehearsal was done on June 1 1950. They met at the 400 club in NYC in 1946, but Django wasn't allowed to perform with anyone except Duke Ellington and Band due to US laws concerning visiting forein musicians. This 1988 book, "meticulously researched with Goodman's active participation" suggests that this concert was radio broadcast and at least part of it actually recorded to disc. To read more one has to buy the book I think. "At least in part, the Paris concert, at the Palais du Chaillot, was broadcast by a French radio network. Extant recordings were taken off the air onto acetates. Because of disc limitation, intro's of some of the selections are clipped, and some have their middle portions excised. But overall, their quality is good, and they are a worthwhile souvenir of Benny's farewell to Europe in 1950." If Django appeared as a "surprise" guest, it's possible they did it as an encore and thus it wasn't recorded, but who knows? 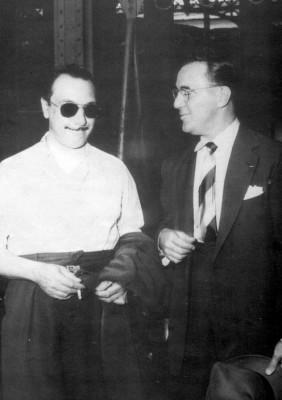 Photo from around this date with Benny Goodman and Django sporting some Bausch&Lomb Ray-ban Aviator sunglasses.